Autumn brides have a wonderful selection of bridal wedding flowers to choose from, so we have pieced together some beautiful autumn wedding flowers designs that are perfect for autumn wedding and are in-line with current trends with bridal bouquets in London. With its golden light and dusky evenings, autumn can provide a stunning backdrop to your big day! Autumn begins in late September and end towards the middle of December. The choice of autumn wedding flowers available to you is sprawling (from ranunculus, hydrangea, and solidaster, to calla lilies, brassicas, and anemones) let alone the wealth of hues and colours that you have to pick from: vibrant jewels, fiery oranges, blood reds, dusky pinks, the clearest and brightest of whites – a little something for everyone! Our talented wedding florists and designers have hundreds of ideas for autumn bridal bouquet designs. Punch of Colour - Spice up your bridal bouquet with zesty orange and reds! The autumn season welcomes bridal wedding colours such burnt orange, fiery reds and natural browns and we recommend taking full advantage of the gorgeous colour tones. For an elegant and stylish bride bouquet include dainty calla lilies with hypercium berries. For a mix of colours, orange calla lilies, deep red roses and pink cymbidium orchids would make an eye-catching display that would be loved by all. Autumn Harvest – A bridal bouquet doesn’t have to include just flowers, autumn has a vast selection of fruits and berries which would work wonders in a wedding bouquet. Red roses with hypercium berries and malus (miniature apples) can be added to a flower bouquet of cinnamon sticks, pinecones and lotus flowers. Country Meadow – Many modern London brides love for their autumn wedding wild flower bouquets which look as though it has been freshly picked from an English meadow. With this in mind our florists would recommend a loose handtie with tom pearce chrysanthemums, carthamus, dahlias, eucalyptus and oak leaves, the autumn bridal bouquet would look fabulous lined with lace fabric and pretty pearl pins. 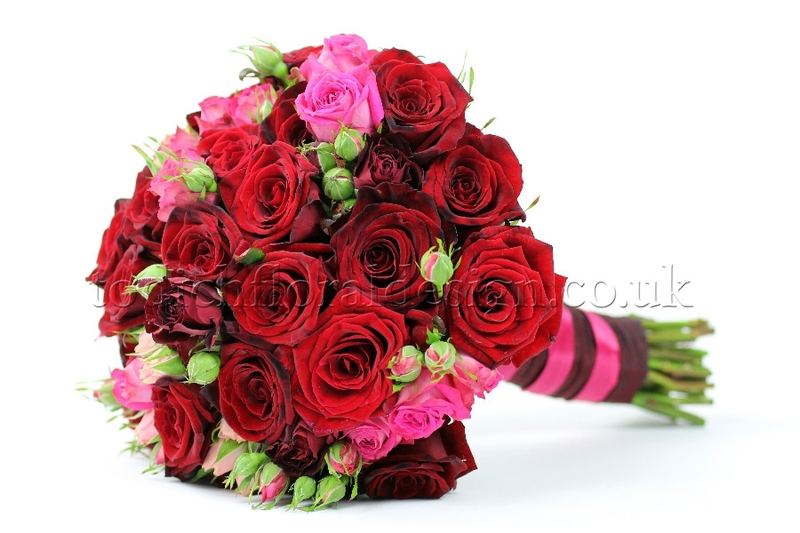 Flowers & Herbs – Autumn is a fantastic time of year to include herbs in to your wedding bouquet. Soft roses with sprigs of lavender, basil, sage and mint would give off a wondrous scent during the wedding ceremony. Essence of Summer – As summer blends into autumn, many brides want to capture a little sunshine in their bridal bouquets in London. Sunflowers are in season until the end of November and are recommended to be arranged with yellow dahlias, orange calla lilies and lotus seeds. Wedding flower stylist Todich Floral Design aims to coordinate the bridal bouquet with all of the other autumn wedding flowers on the wedding day. Whether this will be incorporating a certain colour theme or a flower aspect, we work with our brides to ensure every design is perfect for her wedding day. For wedding buttonholes and wedding corsages we recommend little bundles of herbs such as thyme, mint and sage. Alternatively a mini succulent arranged with scented rosemary would work wonders for an autumn themed wedding. If you wish to add some colour to your buttonhole then our florist’s recommend including sprigs of lavender and heather for an English country garden look. For autumnal table centres we advise mixing cream roses, alchemilla and snow berries with romantic swaths of mint and fresh greenery in a round posy design. If you are looking for cost effective table centres then we suggest calla lilies and still grass swirled around the inside of glass fishbowl vases. We love the idea of blush anemones being centre stage in a wedding reception flower design, the pink petals are accentuated by ranunculus heads which come in varying hues of pinks and purples. Long soft swags of eucalyptus and myrtus can be interspersed with amaranthus and big blowsy dahlias. For scented flower table centres, Memory lane roses, ornamental cabbages, blackberries and trailing jasmine would smell fantastic at any autumn wedding. Clooney ranunculus and mini calla lilies (which both come in a lovely selection of colours) would look great together in a floral table centre, the flowers create a really interesting juxtaposition; domes of hydrangea in their fading hues are the epitome of romance, especially accented with herbs and lavender, and little flickering tea lights. Garlands are a fantastic inexpensive way of decorating a wedding venue, fresh ivy draped around bannisters; staircases or a door frame can make a great impact for any wedding reception. If you have dark corner that need a little more light, then we advice simple tea light candles to give that extra warmth to the venue on your wedding day. If you are having your ceremony in a church, little bunches of berries lend themselves very well to pew ends, and they’d look beautiful with little heads of freesia dotted throughout. If you are after some height for your alter displays, then choose wedding flowers in London such as delphinium, gladiolus, liatris, and lysimachia. The autumn season welcomes stunning blooms such as asparagus, pistachia, and limonium which adds soft clouds of texture throughout a wedding flower display. A way to bring the ephemeral nature of this particular season in, whether you’re getting married in a hotel, restaurant, marque, is by using bird cages filled with wild tangles of berries, flowers, foliage, and surrounded by candles; can you imagine anything more beautiful? We bet that your guests can’t! We are a wedding and events London florist based in the heart of Camberwell, established for over 17 years; we have a spectacular portfolio of floral designs on our online gallery page which show our beautiful wedding flowers in London. Todich Floral Design, Railway Arch 403, Lilford Road, London SE5 9HR, tel: 020 7737 1166 - Copyright© 2019. All rights reserved.